If you read this blog for more than a few days, you figure out pretty quick that I am a structure guy. Most people can recite the bus analogy, “Get the right people in the right seats on the bus,” but what most miss is the quote that immediately follows. “If you get the right people in the right seats (organizational structure) your issues related to motivation and management largely go away.” Jim Collins said that. In my world, Catmull is confused about organizational structure. Your organizational structure is your communication structure. The purpose of structure is to create those necessary communication channels for feedback loops, data gathering, discussion and decision making. Hiring Talent Summer Camp kicks off July 7. More information here. 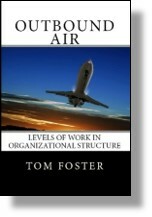 This entry was posted in Organization Structure and tagged communication, manager, organizational structure, right people on June 26, 2014 by Tom Foster. This confusion happens … it is sometimes seen as a nature vs. nurture thing. And it is easy to want a clear (declarative) black or white answer. This same happens when I say ‘System-Drive-Behavior’ and the response is “people make up the system” this is in an attempt to move the people or that people personalities cause system problems. Unfortunately the organizational structure is the boundaries (like a road plan) for communication to happen. The layout of the road and speed limit and enter + exit and all the stuff that goes on is the process for driving behavior in the same way that the org. design is the communication channels. You can put a whole new set of drivers and fancy cars on this road, if the road is the same the same driving behavior occurs. Same with the company. The communication happens within the org structure. BTW – I have not read the book yet and it is on my shelf. Excellent observation. I hadn’t thought about org structure and communication structure that way, but when you say it, and you are familiar with the work of Elliott Jaques, it is an important corollary.